Announcement Welcome to the GemZoanWorld! This is a place where extraordinary creatures called GemZoans that has gems fused to their bodies. These quirky creatures are handmade with polymer clay, gems, and of course, love! The good thing about this is that GemZoans are mosy friendly looking, and not scary at all! (No mean and evil scary monsters allowed here!) GemZoans are eager to be adopted by friends and family to bring joy to their homes, schools offices, etc.! Also, you can place a special order of your favorite pet! *Every GemZoan is handmade and no two are alike. In other words, when you adopt a GemZoan, yours is very special! Welcome to the GemZoanWorld! This is a place where extraordinary creatures called GemZoans that has gems fused to their bodies. 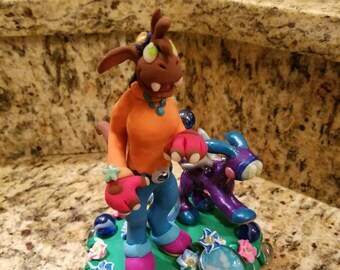 These quirky creatures are handmade with polymer clay, gems, and of course, love! The good thing about this is that GemZoans are mosy friendly looking, and not scary at all! (No mean and evil scary monsters allowed here!) GemZoans are eager to be adopted by friends and family to bring joy to their homes, schools offices, etc.! So cute and well made I can hardly believe it. The perfect addition to my collection of eels. Cute. Love all her products! Our custom "Varky" is perfect and arrived so quickly! Also, wonderful and fast communication with this great seller!